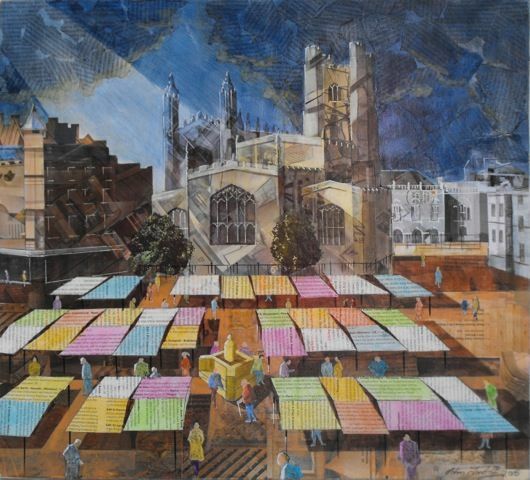 Cambridge has a very vibrant artist community with annual Cambridge Open Studios and flourishing urban sketcher’s group with blogspot and Facebook page with photo gallery. There is also a tourist market with a number of art galleries selling original, print and also cards, some of are images of Cambridge. From my research before the assignment I did not find very much that was particularly striking, compared to sketching techniques I had looked at from other places. Much of it was fairly conventional ink and wash, with some watercolour like the very detailed ink and wash of Peter Wenman. Some etchings that I find too flowery by Walter Keesey from 2013 and Cambridge:The Watercolour Sketchbook with illustrations by Graham Byfield whose style I find quite insipid. Sam Motherwell who does quick drawings on the spot. His charcoal drawings of Cambridge have a simplified, ‘lonely’ angular line, sometimes much more energetic. His drawings of St John’s use ink and watercolour. He also sometimes adds collageand this creates very vivid colours to contrast with the ink line. He also does Black and White linocuts. Frank Hopkirk ink line drawings – often using just one continuous line. He produced a number of cards of drawing of Cambridge musicians that I bought at the 2016 Open Studios. 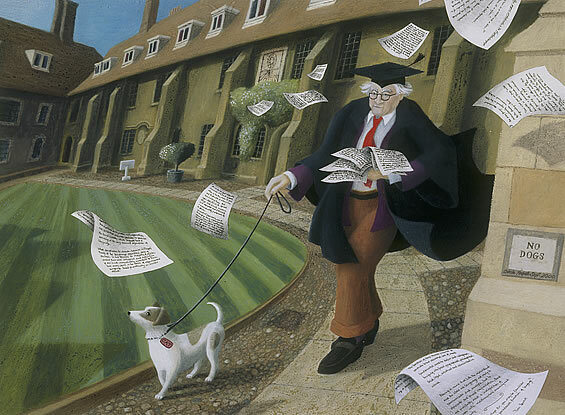 The Cambridge Art Book: the City through the Eyes of its Artists edited by Emma Bennett 2017. The official website has links to the websites of the different artists. The selection on the site is not however the selection I would have made. I have not included actual images here as I am not sure of the Copyright protocol with the galleries and artists. 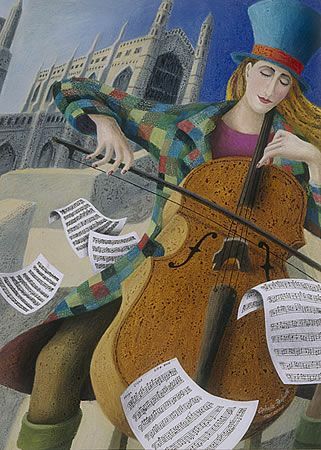 John Tordoff who combines collage – often newspapers – to create tone and texture. His images in the book and on the Byard Art gallery site are very moody, often twilight time, using dark tones and skies, often with windows with lights on. For some reason these are not on his website. I particularly like: Green Street, Walking at Night, What’s on in Cambridge!, Cambridge market, Bridge of Sighs. He also does iPad paintings, but I do not find these as accomplished or interesting as his other work or other iPad art. Claire Caulfield who often combines printmaking with other media. Here images often have an exaggerated curvature of linear perspective to give a dynamic lead in and/or isometric overview and other distortions. Her pen drawings use a range of distinctive ink styles. In her drypoint and chine colle the drypoint gives a very distinctive line to her images and the chine colle add texture as well as colour. Her website also has screenprints some of which also use acrylic and watercolour – these also have a very distinctive irregular line that give a lot of atmosphere and dynamism to the image. Vanessa Stone does papercut work of Cambridge views with a very bold line – similar to what can be achieved with linocut, but flatter and with sharper edges. Rebecca Stark does simplified street paintings in oil, using limited palette and muted colour to create atmosphere and sometimes cutting and pasting sections to exaggerate the shapes – though in many cases I find this overdone and gimmicky. I particularly like Chesterton Lane with Boats, Portugal Place, Market Square. Ophelia Redpath does surrealist, dreamy images with sweeping lines where the foreground is enlarged. Her early paintings used oil pastel overlaid with gouache to give a curdled texture that increases the atmosphere. See for example: Corpus Christ College, Tech tennis balls, Musique Representations. Glynn Thomas copperplate etchings. These have very interesting perspective and composition, combining different elements into one image. See Queen’s College, By the Fountain, On the Cam, At the Mill. Barbara Pierson does simplified oil paintings of people, often on their own, sometimes with dogs, battling the elements. Her images Cycling in the Snow, Wedding Punt, and After the Snow I find particularly atmospheric.